Service Spotlight: Dimensional Inspection | KLH Industries Inc.
Quality cannot be inspected into something. For a lot of shops, a visit to the quality lab is usually the last step of the manufacturing process, however, it is actually the last place you'd want to find non-conformances. If a part is manufactured out of tolerance, it can be inspected until the gages are worn through, and in the end, the part will still be out of tolerance. Therefore, the quality management systems at KLH Industries begin long before the manufacturing of your part, project, or program begins. While creating the job routing for your project, a team of quality assurance personnel and project managers layout the who, what, when where & how the in-process inspection is to take place. That does not, however, preclude the need for a quality lab outfitted with the finest equipment. Things such as; first piece inspection, verification of in-process inspection, sample inspection of internal and incoming product, gage R & R tests and 100% final inspection requirements (typically aerospace) all demand a quality lab. Within KLH's temperature and humidity-controlled quality lab (seen above), the phrase "splitting hairs" simply does not exist. Whereas the idiom "splitting hairs" refers to a unnecessary, and often exaggerated attention to details, in the Quality Lab the thickness of a hair can be the difference between a correct piece and a piece of scrap. Even still, a single strand of human hair is, on average, 0.004" thick, and would have to be split in half six times before reaching the limits of KLH's dimensional CMM inspection services - contact accuracy to 0.00007". According to the Brown & Sharpe website, the KLH’s Global Advantage system "is the most advanced package available today," as it can "handle any measurement and inspection task quickly and efficiently." Not all parts, however, can be inspected via contact probes. Some parts are too small or too soft for contact measuring, and instead KLH utilizes a non-contact Tesa-Visio 300 CNC PC-DMIS Measurement System to provide accurate, repeatable measurements within 0.0001" with variation. Both the Tesa-Visio and Brown & Sharpe CMM feature the PC-DMIS CAD++ software, which allows KLH to import and use solid model files - reducing programming time and eliminating the need for double entry. 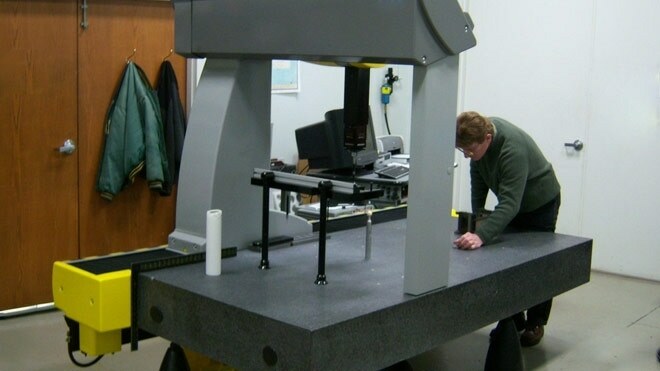 Together, these two extraordinary CMM inspection machines, along with the standard quality assurance equipment, give KLH the ability to meet your company’s most stringent quality requirements. Quality assurance goes beyond inspection. It permeates every aspect of the business. Documented and certified ISO 9001:2000 systems assure you that KLH will meet all your requirements. KLH is currently accepting quotes for contract inspection services, capability studies, and/or reverse engineering. © 2012 KLH Industries Inc.